Money has a dual function. Please allow us to go deeper, and more philosophical than we typically do. We promise to tie this into our ongoing discussion of capital consumption. In the following, we will discuss some examples that use the dollar. We are not conceding that the dollar is money (i.e. the most marketable good, or the extinguisher of debt). We just need some simple cases to consider the medium of exchange. Today, that medium is obviously not gold but the dollar. Money’s first function is flows. People experience this as income. If you work for an hour as a plumber, you might earn $25. If you work for an hour as a lawyer, you might earn $250. If you set up and operate a successful restaurant, you might earn $500,000 in a year. Every job, every profession, and every business earns a certain amount. The market value of everything is finite. These values are set by other market participants, who bid what they are willing to pay for what you do. The dollar is the general medium of exchange. This is how you take what your employer pays you, to buy something from a third party. At any given moment in time, the market value of everything is fixed. You can take your wage or your profits to any other market participant, and buy whatever he produces. For example, the plumber might exchange an hour of his labor for a meal at the restaurant. Or he could exchange a day of his labor for an hour consultation with that lawyer. We can abstract away the dollar, and see that there is a finite ratio of exchange of any good or service for any other. A plumbing repair is worth one restaurant meal, or one tenth as much as legal advice. Since 1981, interest rates have been in a falling trend. Last week, we said this trend will continue, and the present blip up in rates is just a correction. We did not argue technical analysis, nor quantity of dollars, nor the general price level. …It seems obvious that if one wishes to say that a trend has changed, after enduring for well over three decades, one needs to explain why. The Question of the Day is: what has suddenly happened? We discussed a graph from the BIS, showing that as of 2015, 10.5% of corporations did not earn enough gross profit to pay the interest expense on their debt. Even at the lower interest rates of 2015, it is a sharply rising trend (from 5% in 2007). Who knows how much it would have risen even if rates had remained unchanged? And how much did it rise with the little blip up in interest rates we have had so far? To answer part 1, we identified the cause of the trend. The cause is when interest > productivity (return on capital in this context), and each drop in interest drives down productivity. It’s a ratchet. This week it’s the US Dollar Index. Unless you’ve been living under a rock (or maybe that saying should be updated – unless you’ve been living out of range of wifi), you will have noticed 2 key things about the US dollar index: 1. The US dollar bull market seemed to end at the end of 2016; and 2. A violent short-squeeze kicked off in April. But while I certainly would agree that it has all the classical signs of a short-squeeze, I would be quick to point out that there may be a little more to it than that. The chart of the week comes from a report on the outlook for the US dollar (which also dealt with the implications for crude oil prices). 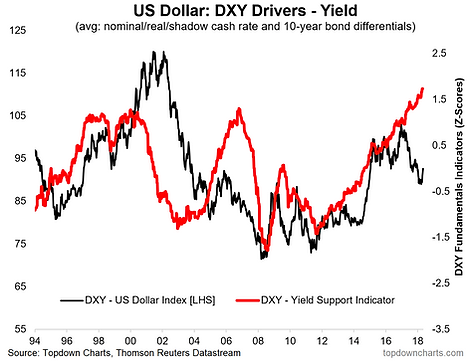 The chart shows my composite yield support indicator for the US dollar against the DXY, with a substantial gap… “the alligator’s jaws”. “…central bankers do not think about gold. This meeting can only be understood in context. So let’s review three key changes to the dollar that led up to it. The dollar had long been redeemable in gold. However, in 1933 President Roosevelt was desperate to stop the run on the banks (and to push interest rates down). He ended gold redeemability to Americans in 1933 (and criminalized the possession of gold). When the soon-to-be-victorious Allied Powers met in 1944 at Bretton Woods, they agreed to an insane postwar monetary system, in which the national currencies would be pegged to the US dollar which would be redeemable in gold at a fixed exchange rate. This system contained the seeds of its own destruction as Robert Triffin said in the 1960’s. However, the Allied economies were in ruins (not to mention the Axis)—so who was in a position to say no? Overnight, the yen rose against all its G10 peers because Donald Trump has lost his mind completely and is now firing everyone in sight. On Thursday evening, the Washington Post reported that a “very stable genius” called “Dennison” is now planning on ridding himself of national security adviser H.R. McMaster who, according to some accounts, once called Trump an “idiot” with “the intelligence of a kindergartner” at a dinner with Oracle CEO Safra Catz.